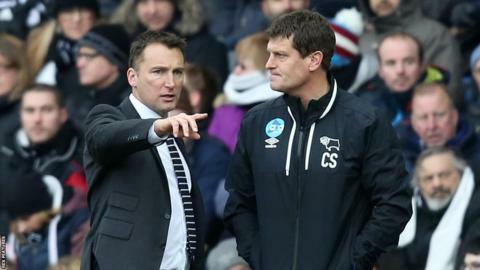 Derby coach Craig Short has said he was "shocked" to be asked to be a part of Darren Wassall's coaching set-up. Short, who spent more than two years as first-team coach at fellow Championship side Blackburn, had previously worked as the Under-21 coach for the Rams. "When I came in the morning after Paul [Clement] had gone I expected to be continuing my Under-21 role," he said. "I have been given the opportunity so I have to try and help the players and team as much as possible." Derby have failed to win a single league game this year, losing four of the seven they have played, which has seen them drop from second place to sixth. However, Short is confident the players can turn around their fortunes as they look to pick up their first league victory in eight. "I understand that the players are going through a lull," Short told BBC Radio Derby. "It affects every team. Brighton had it and have come out of it, why can't we come out of it? "You don't get many chances to get promotion from this division. We're sixth and in a better position than a lot of sides. "There are still a lot of games to go and a lot of points to win, so we just need to get on a good run."